Deploying and managing iPads and iPhones today is drastically different than how it was a few years ago. Today, it’s a known process. You enroll the devices into Apple School Manager or Apple Business Manager, get them enrolled into your mobile device management system, and then you can go from ordering the device directly from Apple straight to handing them out still shrink wrapped. Jamf calls this a zero touch deployment. It wasn’t that long ago that the process was much more complicated than it is today. Let’s take a look back at Apple Configurator 1.0. About Making The Grade: Every Saturday, Bradley Chambers publishes a new article about Apple in education. He has been managing Apple devices in an education environment since 2009. Through his experience deploying and managing 100s of Macs and 100s of iPads, Bradley will highlight ways in which Apple’s products work at scale, stories from the trenches of IT management, and ways Apple could improve its products for students. When the iPad was released in 2010, we were already using iPod touches in the classroom along with the old MacBooks. The entire management process around Apple’s devices was less straightforward. With the iPod touches, we would buy Apple directly from the iTunes store, and then sync them using a case similar to this one. It was slow, cumbersome, and prone to error as I had to often force quit iTunes and restart the process. When I had to apply an iOS update, it took hours to accomplish. When I asked Apple about the licensing around apps, their comment was “Buy it once, and run it on all of your iOS devices.” This model of licensing obviously wasn’t fair (and didn’t last), but it shows that Apple was in a “get devices into schools” mode first rather than build out the infrastructure first. All in all, it was difficult to manage iPads and iPod touches in the classroom at this time. Everything changed in 2012 when Apple released Apple Configurator 1.0. Apple Configurator for OS X Lion makes it easy for anyone to deploy iPhone, iPad and iPod touch in their school or business. Apple Configurator can be used to quickly configure large numbers of iOS devices with the settings, apps and data you specify for your students, employees or customers. You can prepare a set of new iOS devices that are configured only once and then deployed to users. Update devices to the latest version of iOS, install configuration profiles and apps, and enroll them with your organization’s Mobile Device Management solution, then hand them out. Preparing devices is a great deployment option for enterprises and schools where provide iOS devices to employees or students for their day-to-day professional or educational use. You can supervise a set of iOS devices that you want to control and configure on an ongoing basis. Apply a configuration to each device, and then reapply it after each use simply by reconnecting the device back to Apple Configurator. Supervision is an ideal option for loaning iOS devices to customers (for example, hotels, restaurants, and hospitals), sharing devices among students in a classroom or a lab, or deploying devices for dedicated tasks (for example, retail, field service, or medical). You can assign supervised devices to specific users in your organization. Check out a device to a user and restore the user’s backup (including all their data) to that device; then check the device back in and back up the user’s data for later use, possibly on a completely different device. This works well in educational settings where students need to be able to work with the same data and documents over a prolonged period of time, regardless of which device they are given. As you can see, a lot of the terminology still used by Apple today dates back to the introduction of Apple Configurator 1.0. This app was released with support for Apple’s newly announced Volume Purchase Program to support licensing apps in bulk. The process wasn’t as streamlined as it is now, though. I explained the current process last May. TL;DR: You buy an app, and Apple connects the VPP information with the IPA file and sends it to your MDM behind the scenes. With Apple Configurator, you downloaded a spreadsheet (.XLS file vs .Numbers), took the first code, redeemed it into iTunes (using a school Apple ID), and then imported that IPA file into Apple Configurator. Apple Configurator would then asked for a spreadsheet to license the app for the number you purchased. The entire process was prone to errors at every corner. It would frequently not give me a license for the one I had already redeemed into iTunes, and the fix was to call Apple enterprise support. Because these apps were so cheap, I would frequently just buy a few extra than I needed to avoid the phone call. After getting the apps installed, you could also configure additional options like Wi-Fi password and customize iOS restrictions. Knowing what we have now, it seems like an elementary product, but at the time, it was light years ahead of anything that was accessible to schools. Apple was still building out its MDM APIs, and this app was a free way to manage devices. It brought some new concepts (Supervision) to iPad management that we still use today. 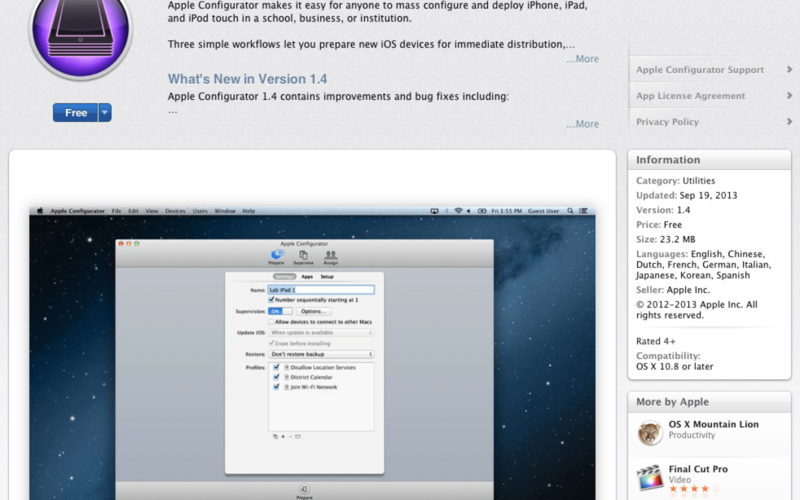 Apple Configurator is now on version 2, and its roughly still the same core app that it has always been. The workflows are a lot different. Personally, I only use it to kickstart some of my deployment stuff, but otherwise, I use Jamf for everything iPad management wise. A weekly series from Bradley Chambers covering Apple in education.